Here at Heart of England Master Thatchers, we use a wide variety of different tools. Take a look at the list of main thatching tools below. 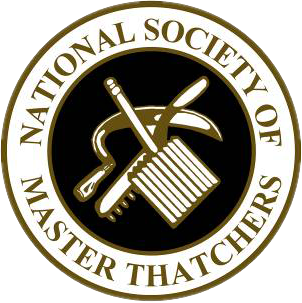 Many Thatchers use a different variety of tools to the ones below. The benefits of having a thatched roof are that it is a very sustainable roofing method and makes use of natural materials which can make is cost-effective. A thatched roof is sustainable and can last around 40 years depending on maintenance and surrounding factors. Thatch can also cope with oddly shaped roofs easily. What tools do Thatchers use? Breaking Check Mark – This is used to tear old reed cladding off. Twister – A twister is a basically a very fancy screwdriver. It is used to twist the stainless steel wires down to the screws for tight fixing. Drill Driver – A drill driver is an electrical piece of equipment used to secure the screw fixings to battens with the use of screws and wires as a fixing method. Brush – The thatching brush is the final piece Thatchers use to brush down a new coat work, getting rid of the loose reed/straw that might have been missed during the securing process. Knife – Not your normal kitchen knife! We use a rather large and very sharp knife to cut strings off bundles, cut out patterns for the ridge and trim the edge of the thatched roof. Shears – Shears are like a very large pair of scissors. 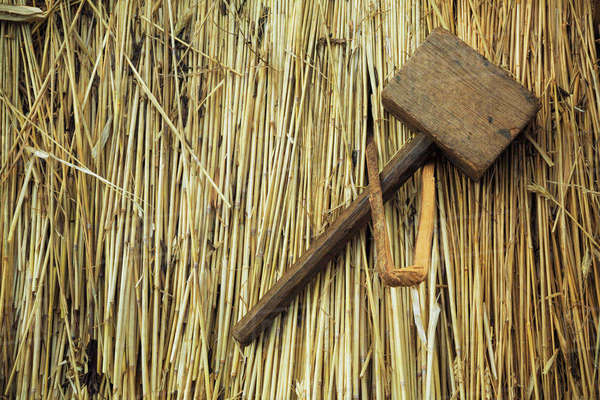 In thatching, these are used for trimming the reed and cutting edges out. Set Pin – A Set pin is used for measuring the depth of the material on the roof. It will be put into the roof, and Thatchers will thatch the roof up to a certain point on the pin. Leggett – A Leggett is a flat headed paddle tool and it is used to dress up the thatched coat if the thatch has been created out of combed wheat reed or water reed. This tool looks like a large comb. Mallet – Our mallets are used to hammer spars and different types of fixings in place, but they are also used to pat the ridge. Stitching Needle – A stitching needle is to stitch the thatch on the sway. Wire Twister – The edges of the wire netting need twisting when the roof is complete, and that is why we use a wire twister. Kneelers – Not a technical piece of equipment but it is still essential in our book. Kneelers are pads worn on the knees to protect a Thatcher from the ladder, as it can be uncomfortable when kneeling. Spar Hook – A spar hook is used as a knife to cut various bundles. If you are considering having a thatched roof and need more information, or if you need to contact us regarding our services, get touch and we will be happy to help!